In Sanskrit, ?Datta? means ?given? and whatever is already given to us is Grace. Lord Shri Dattatreya is the universal Master, Nature and Grace. He is the trinity of Lord Shri Brahma, Shri Vishnu and Shri Mahesh; creation, sustenance and transformation. The human brain has three sections, which correlate to the above concept. So, devotion to Lord Dattatreya works on the individual's brain. Also, the pituitary and pineal, the master glands, are just in the area between the eyebrowes where the spiritual third eye centre is located. In Kaliyuga, that is the present time, Lord Shri Dattatreya is the saviour and He offers worldly prosperity and spiritual consciousness. He is also ?smartrugami?, which means that one only needs to remember Him for contact. He is like Mother Nature, offering complete protection and nourishment. Lord Shri Dattatreya is the son of the Seer Atri and his wife Anasuya, symbolizing friendlyness and freedom from comparison, jealousy and demands. He is accepted as the first world Master from whom all the branches of meditation and tantra have emerged. The gods only control specific dimensions and energies, while the Master is beyond, and even the gods seek His blessings. Lord Shri Dattatreya, the Master, is the main deity for all those spiritual aspirants longing for Moksha / Nirvana. The texts and musical compositions have been specifically selected to suite the energy of Lord Shri Dattatreya, the universal Master, and the third eye centre. 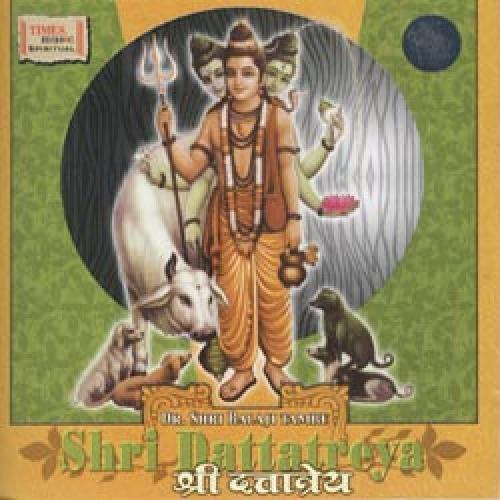 Lord Dattatreya personifies the mighty trinity of Lord Brahma, Lord Vishnu and Lord Shiva: The Guru of all gurus, the all powerfull link between God and man, between creation, sustenance and destruction. Just like the Supreme Brahman, assumed the form of Dattatreya and from that form came out the the three letters A, U, M - so also does Lord Dattatreya assume the form of intelligence in all mankind. Devotion to the Lord helps develop intelligence and a philosophical bent of mind.